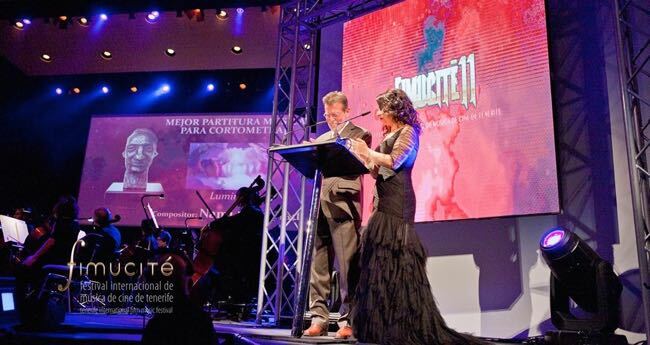 TENERIFE – A celebration of music from screen versions of stories by the world’s most popular horror writer, which closed Fimucitê on Saturday night, featured world premieres of cues from the much-loved 1990 TV adaptation of “It” by Richard Bellis and the current hit feature film by Benjamin Wallfisch. 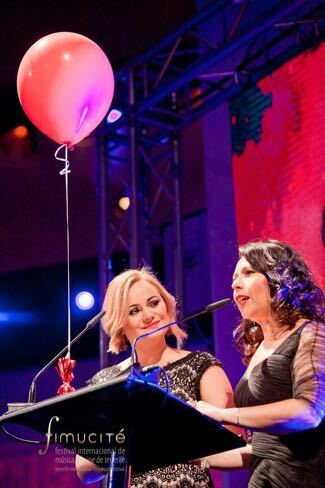 Bellis (pictured above with co-host Ana Molowny) whose Emmy Award-winning score for “It” is one of a long list of Hollywood credits, said that writing music for a Stephen King tale was simple: “You just follow the characters because he always has such great characters.” A senior representative of the ASCAP performing rights organisation, the composer conducted master classes during the festival as he does regularly. After Tenerife, he was headed to Ireland, Norway and the United Kingdom to do more. Waxworks Records will issue a three-disc vinyl release of Bellis’s “It’ score with all 42 cues in November. Many other world premieres were included in “Stephen King Night Gallery” as video clips of typed words from the writer’s works teased the coming terror in each selection. Prolific American horror story composer Daniel Licht (“Dexter”), who had been expected to attend the event before his death in August at the age of 60, was remembered with high praise during the concert. A video showed Red Hot Chili Peppers drummer turned film composer Cliff Martinez present to Licht’s widow, Hilary Kimblin Licht, Fimuticé’s Antón García Abril Award, which honours significant contributions to film music. Cues from Licht’s scores for “Children of the Corn: The Final Sacrifice” (1992) and “Children of the Corn: Urban Harvest” (1995) plus “Thinner” (1996) were heard for the first time in a concert hall. Other first-time presentations included suites from Christopher Young’s “The Dark Half” (1993), Pino Donaggio’s “Carrie” (1976), Harry Sukman’s “Salem’s Lot” (1979), Charles Bernstein’s “Cujo” (1983), Jeff Beal’s “Battleground” from “Nightmares & Dreamscapes: From the Stories of Stephen King” (2006), Michael Kamen’s “The Dead Zone” (1983), Philip Glass’s “Secret Window” (2004), Marc Shaiman’s “Misery” (1990), Elliot Goldenthal’s “Pet Semetary” (1989), Mychael Danna’s “Hearts in Atlantis” (2001), and Thomas Newman’s “The Green Mile” (1999) and “The Shawshank Redemption” (1994). Visuals from the productions added to the power of the pieces and, as might be expected, one of the standouts was a suite by Wendy Carlos and Krysztof Penderecki from Stanley Kubrick’s “The Shining” (which Park Circus will re-release in more than 100 cinemas in the United Kingdom for one night only on Hallowe’en, Oct. 31). Tenerife-born singer Fran León gave a powerful rendition of the title song from “Stand By Me” (1986) written by Ben E. King, Jerry Leiber and Mike Stoller. 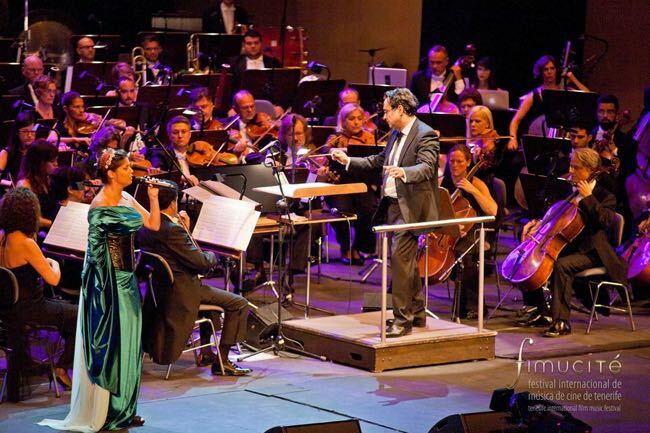 Vivacious Spanish vocalist Cristina Ramos (pictured above with Diego Navarro), winner of the 2016 “Spain’s Got Talent” show, displayed her operatic talent on “Dead Can Dance”, written by Lisa Gerrard and Brendan Perry for the 2007 film “The Mist” and showed her rock and roll chops (pictured below) in the show’s encore with a dynamic performance of AC/DC’s “Who Made Who” from “Maximum Overdrive” (1986), the only film that Stephen King directed. Nikiforos Chrysoloras did the arrangements of the three songs. 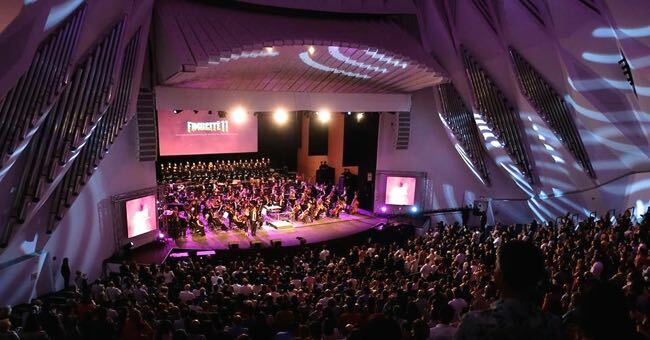 The concert brought Fimucitê to a close after eight days of screenings and concerts that included “The Beyond” (Composer’s Cut”), “Tarantino Unchained”, “All About Almodovar”, “Soundtracks of Spain”, “Warriors From the Silver Screen” and “Sword & Sorcery: Symphonic Chronicles of a Legendary Era”. This entry was posted in Film, Music and tagged Ana Molowny, Children's Choir of the Professional Conservatory of Music of Santa Cruz de Tenerife, Cristina Ramos, Daniel Licht, Diego Navarro, Fimucité, Juan Ramón Vinagre, Magdalena Miska-Jackowska, Orquesta Sinfónica de Tenerife, Richard Bellis, Stephen King, Tenerife. Bookmark the permalink.